If baking a loaf of bread like this makes you nervous, relax! Even though it looks super fancy, it’s not necessarily any more difficult than other bread recipes. 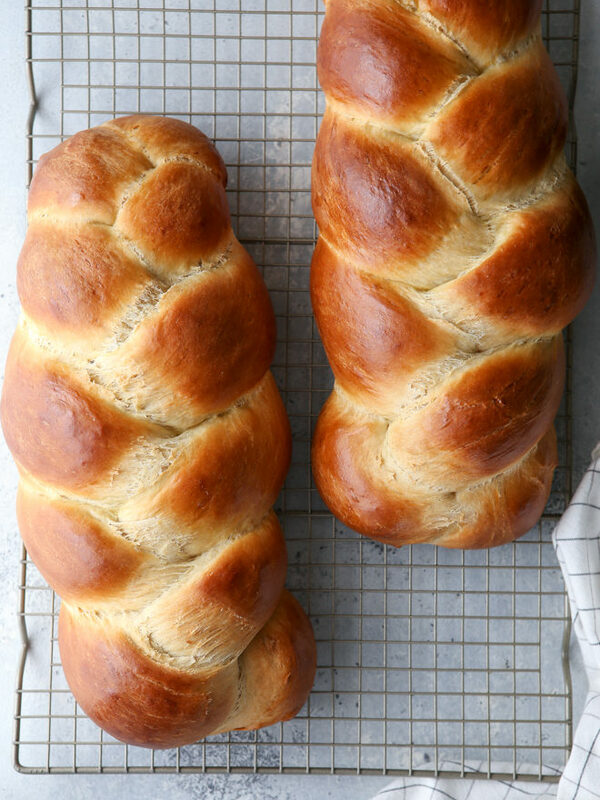 I first shared this braided Challah recipe in 2009, but today I’m giving it a complete overhaul with more information and resources. The recipe is exactly the same though, it’s tried and true! Challah (pronounced holla) is an “enriched yeast bread”, which means it has a higher fat and sugar content than other yeast breads. It’s made with eggs, butter, honey, bread flour, yeast, salt, and water. It’s traditionally a part of Jewish cuisine, typically served on special occasions like Sabbath and other major Jewish holidays. 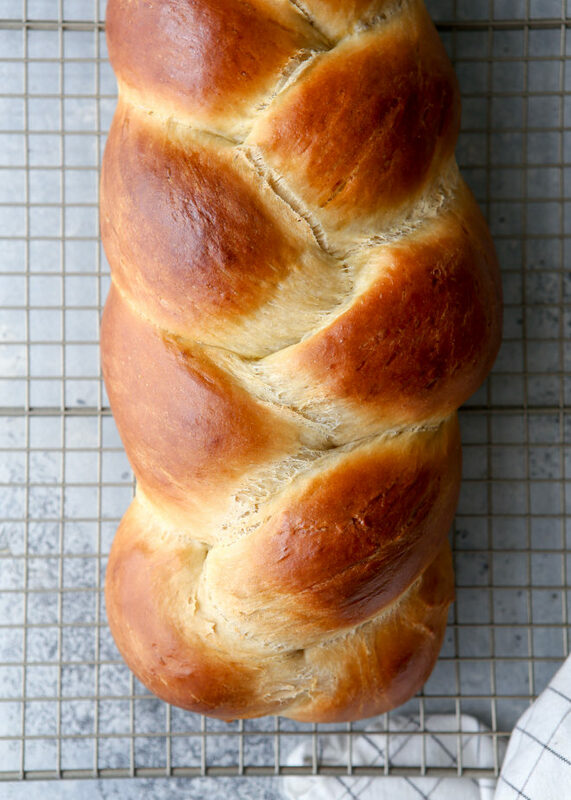 Why do you braid Challah Bread? 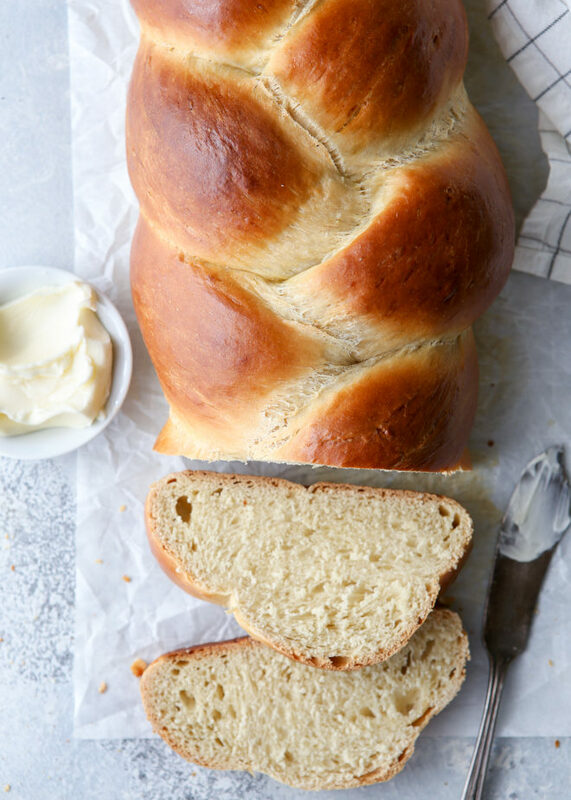 Because Challah is made with extra butter and eggs, the dough is very soft and doesn’t hold its shape well. 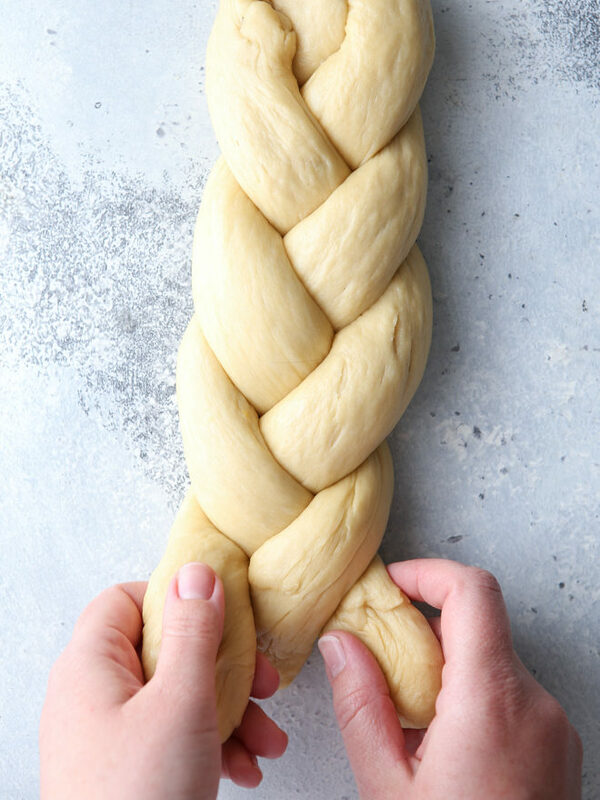 Braiding the challah gives it structure during proofing and baking. You can also bake it in a loaf pan, but braiding is more traditional (and much prettier!). You can do a simple three-strand braid  (as I’ve done here) or a four , five  or six-strand braid , and even a round braided challah loaf  if you’d like. Follow the links for very helpful online video tutorials that will walk you through how to make each of these shapes. Don’t be intimidated, it really is quite easy! Can Challah Bread be made ahead? Let the braided loaf rise in the fridge overnight. When ready to bake, let it come to room temperature first. Freeze unbaked braided loaf for up to 1 month or more. Make sure that it’s double-wrapped in plastic. When ready to bake, let thaw in the fridge overnight, then let it come to room temperature and rise before sliding into the oven. Freeze baked braided loaf for up to 1 month of more. You can freeze the whole loaf or a few slices. Again, make sure that it’s double-wrapped in plastic. To thaw and serve, unwrap and heat in a 325°F oven for 20-25 minutes for the full loaf, or 5 minutes for a slice. Do not let the bread thaw at room temperature or it could actually cause it to go stale. 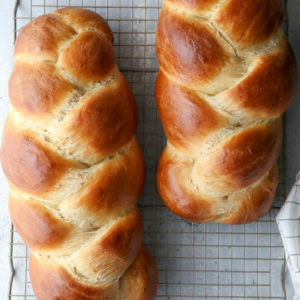 Challah Rolls  — just like this bread, only in single-serving portions! Note: this recipe was originally published February 2009. Melt butter in a small saucepan over low heat. Add honey and water and heat to 120-130°F, or until very warm but not too hot to the touch. Add 3 cups of the flour, salt and yeast to the bowl of a stand mixer. Add butter mixture and eggs and mix until it forms a very wet dough. With the mixer fitted with a dough hook on medium speed, add the remaining flour 1/4 cup at a time. You may not need all 6 cups of the flour, or you may need more. Use only enough dough to achieve a dough that is moist and sticky, but does not actually stick and come off on your hands when handled. Knead the dough until smooth and elastic, another few minutes more. 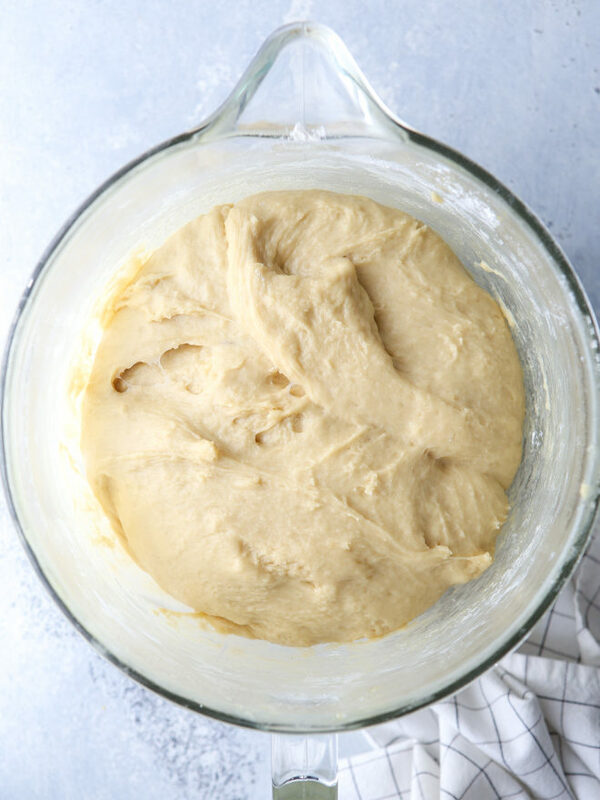 Place dough in lightly greased bowl, cover and let rise in a warm place until doubled, about 1 to 1 1/2 hours. Punch down dough and divide into 6 equal portions. On a clean un-floured surface, roll each portion into rope-like pieces approximately 18 inches long. Work with 3 ropes at a time to braid into two loaves, pinching and tucking the ends under. Place dough on parchment paper lined sheet pans. Cover with plastic wrap and let rise until doubled again, about 45 minutes. Whisk together egg and brush onto loaves. Bake at 350°F until loaves are golden brown and sound hollow when thumped, approximately 40 minutes. Cool completely before slicing. I’d love to hear about it! Leave a comment below, send me an email , or take a photo and tag it on instagram  with #completelydelicious .